There are a lot of things that are needed to be done to construct a structure. Building a space be it for a private or commercial purpose is something that follows processes and steps for its completion. 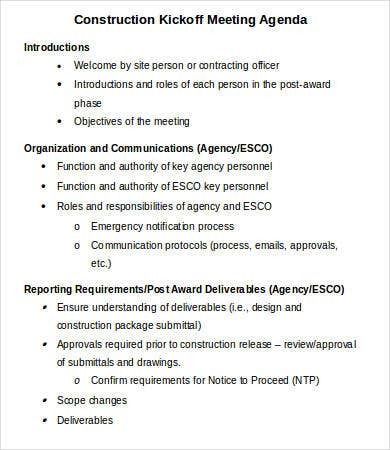 This is the reason why it is important to create professional relationships with all the people that are involved in the construction as all of you are going to work for a common goal and that is to finish a project at a given time. 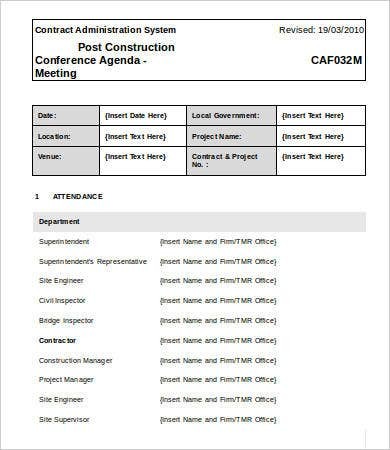 One way of keeping in touch with the construction team and the entire construction processes is to set construction meetings. 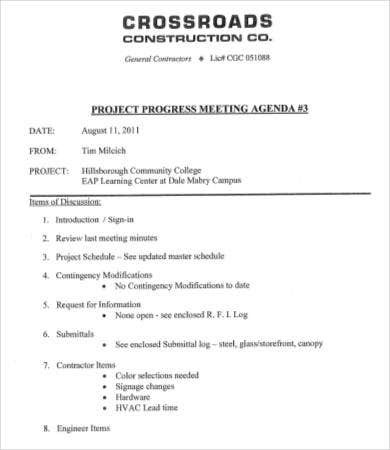 These meetings must have specific agendas to assure that everything is working just fine and the entire construction team is following the schedule that they need to religiously consider. 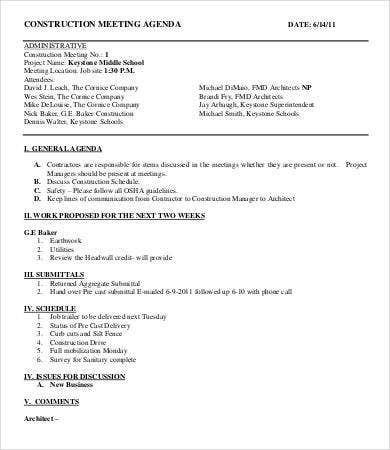 You may view our Meeting Agenda Template so you have a reference on how to create a meeting agenda. 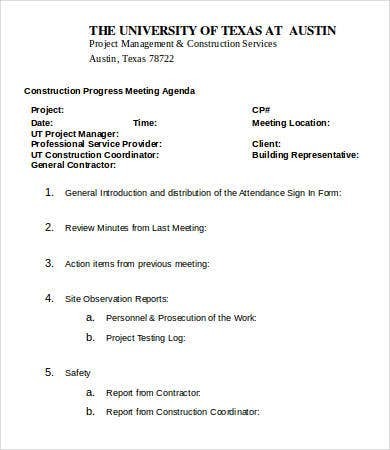 Other than our construction meeting agenda, you may also download our Safety Meeting Agenda Template and Management Meeting Agenda Template to serve as your references. 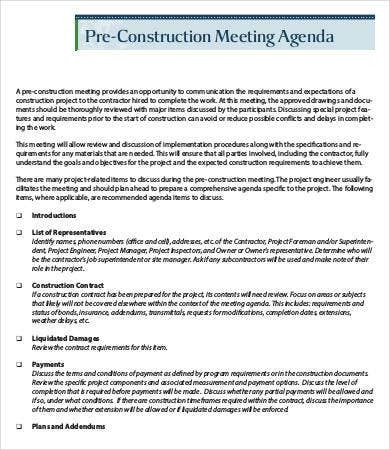 It is very important to have a construction meeting agenda as it allows people in the construction team to understand everything that they need to do from the very beginning of a construction project up to finalizing it. 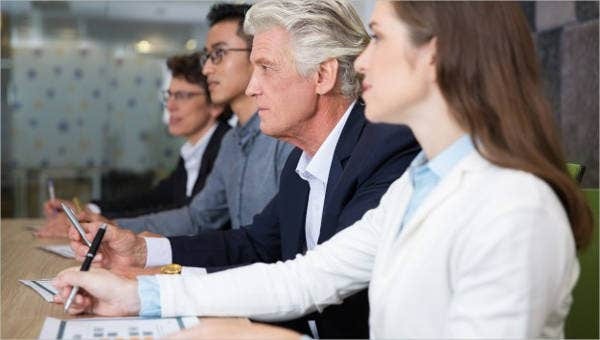 A meeting agenda serves as a checklist of the reminders that are needed to be instilled in the mind of everyone so that no functions and duties will be forgotten or overlooked. 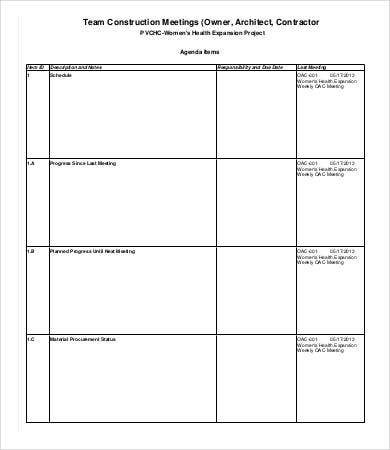 Aside from our construction meeting agenda, you may also download our Team Meeting Agenda Templates.